The newly-launched ANDRE Advanced Near-field Detection Receiver from Research Electronics International is helping prevent fraud at exam testing sites. Originally designed for counter surveillance operations and intelligence protection, the ANDRE is now also helping educators prevent cheating during examinations by detecting covert electronic transmissions. According to news reports out of Brazil*, eleven individuals were arrested last year for using electronic devices during the high-profile National High School Examination (Enem). This year, the Ministry of Education will be using ANDRE to locate and identify participants who attempt to use electronic devices during the exam who may have circumvented inspection by metal detectors. The ANDRE is a hand-held broadband receiver that detects and assists in locating nearby RF and other types of transmitters, including mobile phones. Antenna probes included with the ANDRE can be used to search for known, unknown, illegal, disruptive, or interfering electronic transmitters. Hidden electronic devices are easily concealed in a variety of objects and access to eavesdropping and electronic bugging devices is becoming easier and more affordable. 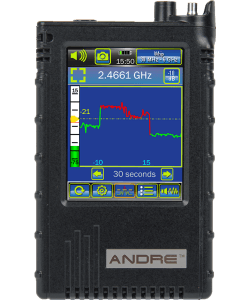 The ANDRE provides mobile RF search capability to help locate these hidden transmitters quickly and discretely. 455 Security Drive, Cookeville, TN 38506 U.S.A.